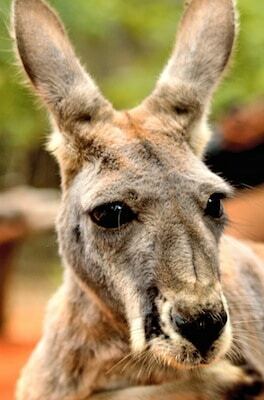 There are quite a few different Kangaroo species out there to learn more about. It is believed that they have been around for millions of years. Yet we don’t have very much evidence in the way of fossils to give us very many answers. For example it isn’t known how the different species branched off from each other. There are only an few main groups of Kangaroo species out there. Yet there are more than 80 of them total when you start to break them all down into sub species. That can become more complicated at that point to keep where each of them belongs in the overall scheme of things. The umbrella that they all fall under though is called macropods. There are two categories of families that they are further divided into from there. The first one is the Macropodidae. Most species of Kangaroos fall under this one. The second category is the Potoroidae and Rat Kangaroos fall into this one. The Red Kangaroo is one that you have likely heard about. This is the largest mammal found in Australia. It gets its name due to the reddish tint of its hide. They are also the species that is well known for the typical boxing moves. They do this for the right to run the mob and for mating purposes. The Eastern Grey Kangaroo has a thicker coat that most other species. In fact, the gray coloring on the back with white down the front and large ears reminds many people of an oversized rabbit. They are also the fastest of all species of Kangaroos. One was actually recorded going 40 miles per hour. There is also the Western Grey Kangaroo that is a lighter color of gray. These are very curious animals which can get them into trouble. For example it can lead them to where humans are hunting or to where traps have been set for them. They also give out a very strong odor that is unpleasant. No other species of Kangaroo is known to do this. One of the most unique and interesting types of Kangaroo species out there is the Tree Kangaroo. As you guessed, they live in trees. Of course they are much smaller than the Kangaroo species you see out there hopping across roads and such. They have to be light enough that the trees they are in will be able to support their bodies. There are several species that fall into this category. Almost all of them are considered to be endangered at this point in time. The Rat Kangaroo is very small and also a unique looking creature. It look so much like a rat that it is often confused as one. People don’t realize it is anything different until they see it move. Fully grown they are about 20 inches long and weigh about six pounds. They are considerably smaller than what we picture in our minds for a Kangaroo to be. Efforts have to be taken in order to protect those Kangaroos species out there as many of them are considered to be vulnerable at this time. At least two species are already on the list of Endangered animals. At least seven different species have already been documented as being extinct. As you start to learn about the many Kangaroo species out there you will find some that are more of interest to you than others. It can be fun and a great learning experience to take one of them at a time and to learn all you can about them. While there are some common characteristics for Kangaroos, the various species all have their own unique qualities that you will find quite fascinating.